1 Yeti: Isaac! No, you're not late. In fact, you're early. I didn't give you the list of people to pick up. 2 Isaac Newton: Never mind, we're all here now. Give me the list another time. 3 Yeti: You know that sort of thing messes with the time-space continuum. 4 Isaac Newton: Oh, like I care about how the universe works. 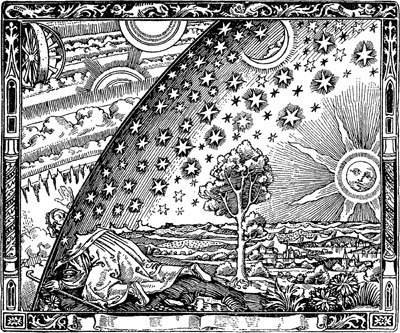 You've probably seen the famous Flammarion engraving (even if, like me, you didn't know what it was called until just now). The interesting thing about it is that nobody knows where this image came from. Its first known appearance is in Camille Flammarion's 1888 book L'atmosphère: météorologie populaire, but Flammarion does not credit an artist and the source of the image remains unknown. It is not, as is often claimed, a medieval work, but one of approximately the same age as Flammarion's book. It's possible that Flammarion produced the image himself, having engraving skills, though there is no solid evidence either way. Last Modified: Wednesday, 15 June 2011; 03:11:01 PST.